Grill Em All Truck – Los Angeles, CA – Head Bangin’ Burgers! 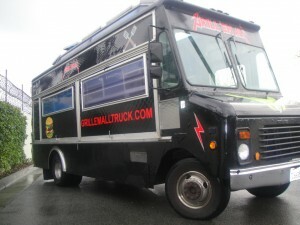 (@grillemalltruck) – Food Truck Talk – Searching for the best foodtrucks! 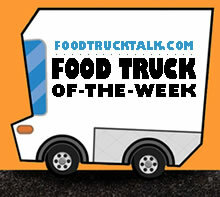 Congratulations to Grill ‘Em All Truck as FoodTruckTalk.com’s Food Truck Of-The-Week! Note: This food truck is not currently operational – they now have a brick and mortar location (see below). The synergy is perfect: Rock n’ Roll, Heavy Metal, an attitude and great bugers! There is no doubt, Grill Em All Truck is delivering it all. Chef Ryan’s has a background in fine dining so it is not unusual that Grill Em All serves unique and gourmet burgers with a side of heavy metal. Is there anywhere else you can get a gourmet burger with cream cheese, deep fried bacon, beer & Siracha soaked onions & garlic aioli? 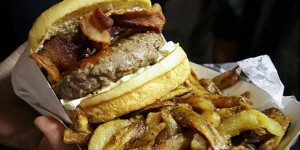 Or a burger with cranberry flavoring along with Maytag Blue Cheese and potato chips. The Waste Em All burger features marinated green chilies, pepper jack, beer soaked onions. And don’t forget the fries, they are perfection! I can just imagine Ryan and Matthew in the kitchen, heavy metal music blaring as they are collaborating on creating another great taste combination for a Grill Em All burger. Jerrold Ridenour did a great video profile of the Grill Em All truck for Food Trucking TV. This video really illustrates the vibe and attitude that Grill Em All delivers! Grill Em All will give you a truly gourmet burger, with unique flavor combinations, along with some great music. There is no way you can go wrong with that combination! Also, check out Grill Em All’s merchandise store at http://www.indiemerchstore.com/grillemalltruck, nice looking garb. The store is like the tables set up at rock concerts to sell T-shirts and cd’s only in an online form! I need to get one of their burger logo t-shirts and hat! Grill Em All burgers are also available at their brick and mortar location: 19 E. Main St., Alhambra, CA 91801 – website grillemallburgs.com.